KIEV, Ukraine -- Gas is flowing again from Russia to Ukraine, but blackouts have hit factories and homes. 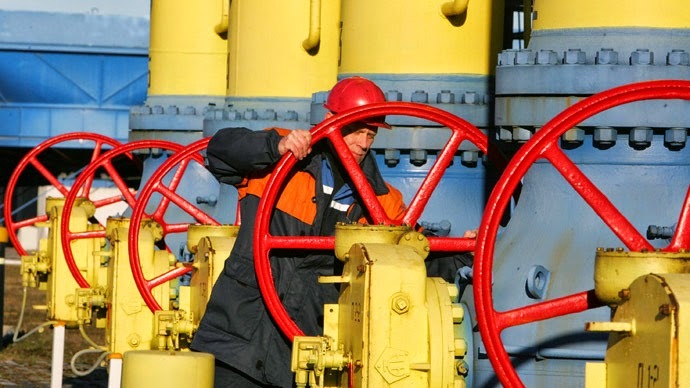 Ukraine needs energy reform to fix the economy and weaken Russia’s grip. Ukraine’s prime minister, Arseniy Yatsenyuk, says Ukraine’s independence is compromised by its energy dependence on Russia. Mykhailo Honchar of the Centre for Global Studies in Kiev claims that in its battle in Ukraine, Russia has opened an energy front where it has big advantages—thanks to Ukraine’s own failings. Until the 1970s Ukraine powered the Soviet Union. But since independence in 1991, inefficiency and falling production have left it reliant on Russia. The problems are crystallised in Naftogaz, a state-controlled gas giant with a bigger budget deficit than Ukraine. Ukraine has spent $6.4 billion keeping the company afloat this year, much of it going to Russia’s Gazprom. After Naftogaz was created in 1998, it soon became a fount of corruption. Artificially low prices and patchy metering offer ample pickings. Opaque finances and central control over extraction, transport, storage and sales allow rent-seekers to act with impunity. Yevgeny Bakulin, who led Naftogaz under President Viktor Yanukovych, is under investigation for corruption. Yet he has won a seat in parliament for the Opposition Bloc led by Yuri Boiko, another former Naftogaz official. The new energy officials, including Naftogaz’s 36-year-old boss, Andriy Kobolev, are an improvement. Mr Kobolev is opening up the company’s books. He has secured reverse-flow supplies from Slovakia, a deal for imports from Norway and an international loan to refurbish ageing pipelines. But Ukraine’s energy oligarchs will complain, and some wonder if Mr Kobolev has the strength to take them on. Prices need to be raised to market levels, with subsidies only for the neediest. Energy conglomerates, including Naftogaz, must be broken up. Ukraine has to do this both to balance its budget and as a member of the European Energy Community treaty. Mr Kobolev argues for shock therapy. “It’s better to cut off the dog’s tail all at once,” he says. This requires politicians to be “brave enough” to deliver unpleasant news, which Mr Yatsenyuk promises to do. Yet Mr Yatsenyuk has ducked hard decisions on energy. Inflation ate up an initial price increase demanded by the IMF. Rather than putting up prices again, Ukraine pushed up taxes on private producers. Mr Yatsenyuk told big manufacturers to purchase gas exclusively from Naftogaz, strengthening its monopoly under the pretext of increasing revenue. A third was a plan to import coal from South Africa. The deal, meant to offset disruption in supplies from eastern Ukraine, ended in another scandal over the coal’s quality. With separatists in Ukraine’s east controlling the biggest coal mines, Ukraine has been forced to buy coal and electricity directly from Russia. Otherwise power shortages could have been devastating, a fact Russia underlined by holding up a coal train at the border. Ukraine’s new energy minister, Volodymyr Demchishin, is hoping to retrieve coal from storehouses in the besieged city of Debaltseve. Meanwhile Ukraine could raise output at its nuclear power stations—if they are safe. An emergency shutdown knocked out a plant in southern Ukraine last month, awakening ghosts of Chernobyl. Worse, Ukraine imports most nuclear fuel from Russia, despite increased co-operation with Westinghouse, an American firm. And Ukraine relies on Russia to store nuclear waste. As Mr Honchar notes, with so many pressure points, the Kremlin does not need troops to “strangle Kiev”.